ground walnuts, honey and butter that infuses the dough with walnut flavor and a hint of purple. What helend said. The color is just gorgeous and I love the large chunks of walnuts too. I'm putting this on my list -- thanks for sharing it. Ditto on what Susanfnp and helend said. 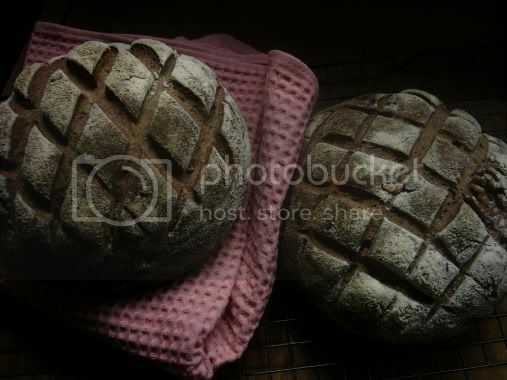 Those are the perhaps the best looking loaves I ever seen. Any chance of sharing the recipe? Purple tastes a little red, a little blue, very appropriate for the Fourth in the States, huh? And there's only the little bit of honey in the paste to sweeten it, but it seems just right. Thanks, Weavershouse. Place in bowl of small spice or coffee grinder (I used a blender). Grind for a few momoents til you have a smooth soft paste. Dan says to mix the flours and salt, then add to the remaining combined ingredients. Combine as evenly as possible with your fingers. I just dumped it all together after weighing. Cover and leave 10 minutes. Knead for 10 seconds. Leave for another 10 minutes. Knead once more and leave for an hour in a warm place. Line two 1.5 litre bowls with flour-dusted tea towels. Divide dough, shape into balls and leave in the bowls seam-side up, covered with the edges of the towels, 2-2 1/2 hours or almost doubled. Oven 210C/410F. Turn dough out onto floured baking sheet (I used cornmeal.) Slash in a criss-cross pattern. Bake in center of hot oven 50-60 minutes til a good rich brown. Cool on rack. --I find it hard to follow Dan's method precisely just because of the back-and-forth timing, I get distracted with other things, so after the first 10 minute rest I kneaded til the dough felt good and let it be. The dough was not at all a wet one, and the second time I made it I added a bit of water to get it softer, but not at all gloppy, still what I would call a firm-ish dough that took slashes well and held its form readily. The bigger your walnuts the flashier your loaf will look when sliced, too. Dan says to knead on an oiled surface. I knead in the bowl and didn't find that oil was neccesary. --Thanks, guys, I appreciate your kind words. And I have unicorns...which aren't nearly as helpful around the house. Do you take a seasonal bread break, Mini O? And Korea now? My word. Here's me who calls twenty miles away from home an adventure. Just a note to let you know I baked some with about 250g of whole walnuts in 100% rye. Rye, water, rye starter, brown sugar, salt, spice and walnuts, lots of walnuts. Well the starter was fantastic, and I should have put the nuts in after kneading and the loaf looked great. But the middle didn't cook. The first centimeter of crust tasted super. I had to cut the loaf lengthwise and bake again. Now it's too dry to eat but so good! If ever again, a small long loaf, and reduced temp and long bake. The first loaf was much softer the next day and I needed snacks for the plane. So I cut them into thin slices and broke them apart, cookie size and stuck in a cored apple wedge. It's an old trick to moisten up hard dried cookies. The second loaf came out much better. Walnut rye bread: A knife has been poked into the dough to release any big bubbles and allowed to proof 30 minutes in a casserole dusted with rolled oats. It's ready for the oven. Notice how different it is to normal wheat dough. Also, I mixed the dough thoroghly before adding the nuts, made a big difference! Your conversation is always so interesting, and now, Mini Oven, I am loving the new, illustrated version of you! 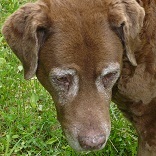 Browndog, that is such beautiful bread. I love your patterns. I am not a great walnut fan and my husband will not touch them but you're really making me want to try this. 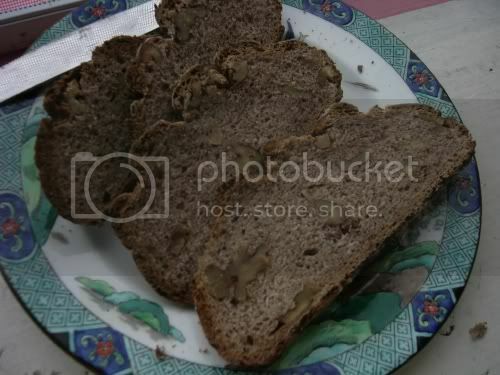 I have actually wanted to try PR's gorgonzola walnut bread especially since I found out walnuts make purple bread. Your bread really looks delicious. I have a walnut-hating kid who won't eat a chocolate chip cookie if he thinks it might've shaken hands with a walnut... I love them myself. The purple is subtle but it's definitely there. Mini Oven mentioned hickory or hazelnuts, I can't find hickories but if you like them I think hazelnuts would be awesome, roasted first. Acting on a suggestion of Our Bill's, not to mention your enthusiasm, I've begun keeping a Glezer-type starter, and am currently waiting on my third batch of Columbia. I'm seeing why you are so taken with her recipes and techniques, when Walnut and Rustic bread aren't my favorite, Columbia is. Hi, Dorothy, it's great, isn't it? Yes, Dan instructs to knead only 10 seconds each time. This is another dimension of the 'let the dough do the work while you sip your iced tea and read a chapter of a good book' approach. Do you find it works for you? I am really green at bread making, with the exception of the bread machine, which is pretty much dump and bake. I am having a hard time trying to firgue out if it has risen enough..too much..or not enough. Some times transferring it into the oven or at times slashing it I can watch it deflate. Oh... is the rye/white leaven sour??? Yes, you're right that your dough shouldn't really deflate on transfer or slashing. How is it after bake? Does it gain back volume from oven spring, or does it just sit there or worse, get smaller? If you are getting good oven spring you can assume it's not over-proofed. If it's shrunk and wrinkly-crusted it was over-proofed. Do you know about the 'poke' test? It's not really a poke but a press. Press your finger gently against the surface of the dough. If the dough springs back quickly, give it more time. If it fills in more slowly it's probably ready, and if the dent stays there or even starts the dough deflating, you are over-proofed. Poke your dough at various stages of rise and you'll see how differently it responds. It is generally better to under-proof if you are unsure, but as long as the dough isn't on the brink of collapse you can still bake it and get pretty nice bread, if you don't have time to reshape. This dough has yeast as well as starter (leaven in Dan's British) so it is not terribly slow or fussy. If your temperatures are warm, between 75-80 degrees, the proof, that is, second rise, times should not be any longer than stated (2- 2 1/2 hours) and in this summer weather it could be much shorter. You can judge from how fast the bulk, or first, rise went, how light and airy the dough is (or isn't) after the kneading and rests. If your house is warm and the dough is rising well, I would begin to check the shaped loaves after 45 minutes or an hour. It's easy to give it more time if it wants it. And by the way, if you think your loaves are seriously over-proofed, you can always degas them, reshape, and give them a third rise. Yes, the leaven is what we on this side of the ocean would call sourdough starter. Dan calls for rye starter, which I don't keep, so I used my white. completely beautiful girl! I've missed your voice on the blog! You're a sweetie. Guess what I'll be doing this evening around six. Making Katie's and your English Muffins, in honor of the fact that my oven died and I am reduced to solely stove-top cooking (and baking.) I was torn between the sourdough and the yeasted version, but as this summer weather seems to be starter adrenaline I figured I ought to take advantage of it. It may choose to hibernate in another month or two. demise!!! Sob! (Oh wait a minute...it's August. It's hotter than h-e-double hockeysticks...) Or...is that your clever story and your sticking to it, missy?? Huh? Well I'm still sad we won't be seeing any of your masterpieces for a whole month!!! But I can't wait to see your stovetop masterpieces! :D I have a challenge for you! So I can't wait to see your muffins, Katie's Muffins! And of course you must do the crumpets! And, I think you can also do the pita breads I posted on a stovetop grill as well! The sourdough really is good. Mini, I think the bacon sounds so yummy! Of course you know my feelings, how can anything with bacon not be incredible!?! I have to tell you, BlueZee, that since we have two big ol' warhorse dutch ovens for Scout camping (my husband the eternal Eagle Scout. My son humors him admirably.) I did have a brief encounter with the thought of using one stove top. But it didn't seem promising. Echoes of 30 years ago when I was an ovenless young homesteader. Saturday night 'Black-Bottom Pizza' Club. I suppose a diffuser is a lot like what it sounds like, huh? Well, I'll take a peek, since you insist. I did do the steamed buns a while back (xma. Whatever happened to her? I hate when people disappear.) They were highly popular. I should do them again, I'd be popular too. All good suggestions. Stovetop pita? Hm. You think? My son likes pita and I haven't made them for years. One of the rare avenues that guide veggies into his system. Oh, and YES, it really IS poorly (my oven.) It's not quite so hot in the northeast quadrant, my dear. Hot enough, mind you. But the sourdough has taken off so grand with the steamy temps that it seems a shame not to take advantage. Well, a thinking person, clearly you are. And here I was enjoying a good pity party. Now I have to have my horizons stretched. Ouch. Thanks for the energy injection, BlueZebra. You're a gem. Oh, oh, oh---the Huxley boy! had another thought in the meantime! How's about building a wood fire in your charcoal grill? Then once it dies down, you nestle your bread in it and pour the coals on top of the castiron aka Boyscout style! Or alternately, you could make an indirect heat fire and cook it on the grill grate with the lid closed! I use our grill to cook long cooking stews and chilis cuz I can't stand the smell that lingers and permeates the house! Ours can cook as low as 250 but does an outstanding 350-450 degrees as well! Works just like an oven! Oh browndog hows about a challenge!? How about a Vermont Sourdough or Bill's SD Pagnotta cooked in a pan on our grills? BlueZee, we're gonna get in trouble for talking in class at this rate...I do gotta go (farrier date, how are your hooves BTW?) but you know why I can't do the grill? Don't have one. I bet it would work a treat really, though. Could do the fire pit. I'm not desperate quite yet, but I feel it comin' on. So glad to get the heads up on season 3. We're in Who withdrawal, very ugly and sad. And , OH-H-H, Ferris Bueller! I did see that, last century sometime, but I bet my kid would like it and it would seem fresh to me anyway, it's been so long. Thanks! Wow! This looks really really good. I can't wait to give it a shot. These are gorgeous. Great job. I haven't tried Dan Lepard's Walnut yet, but I've tried Nancy Silverton's. It's one remarkable bread, that's for sure. I think I'll try Dan's and see how it compares. I definitely recommend trying Nancy's (even if the walnut oil (l'huile de noix) isn't cheap.